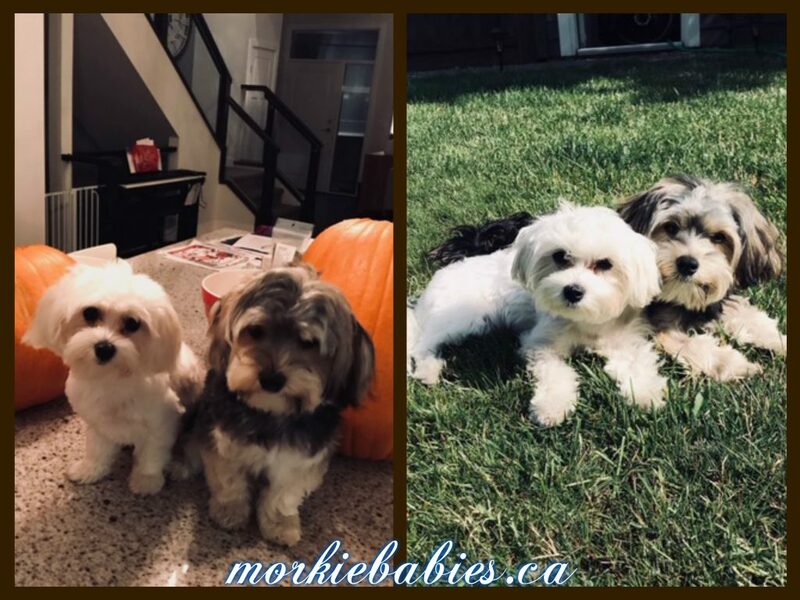 Here’s Zoey (female White & Cream) and Zachary (male Black & Tan) two of our Darling Morkie babies. Happy Birthday kiss to Zoey from Zachary. 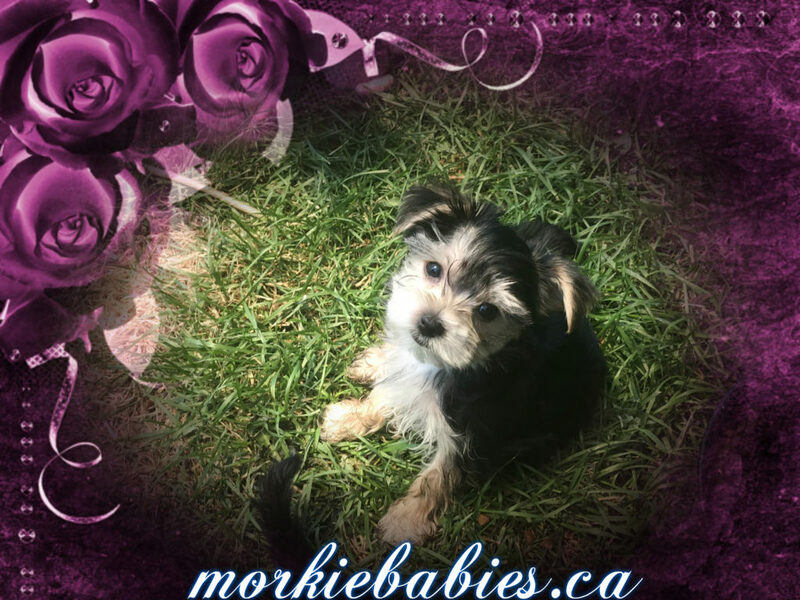 Pretty sure we will be chatting again possibly next year for another sweet Morkie. You breed great babies! ❤️ ~Cathy~Kelowna, B.C. 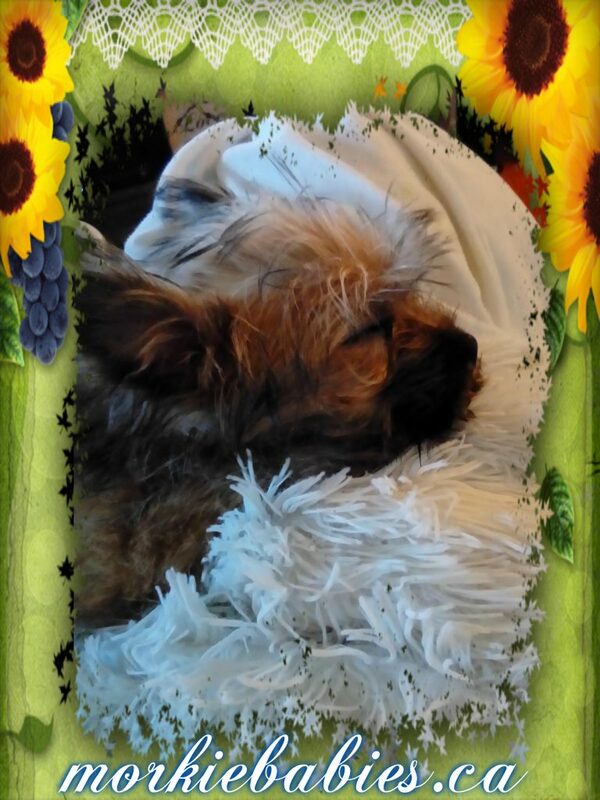 Hi Ruth, Mia has had her last shots & she is sleeping now & I am getting a rest. She is ready to go outside in 3 or 4 days so the Vet says. I got her a little yellow slicker yesterday, and some random shots. 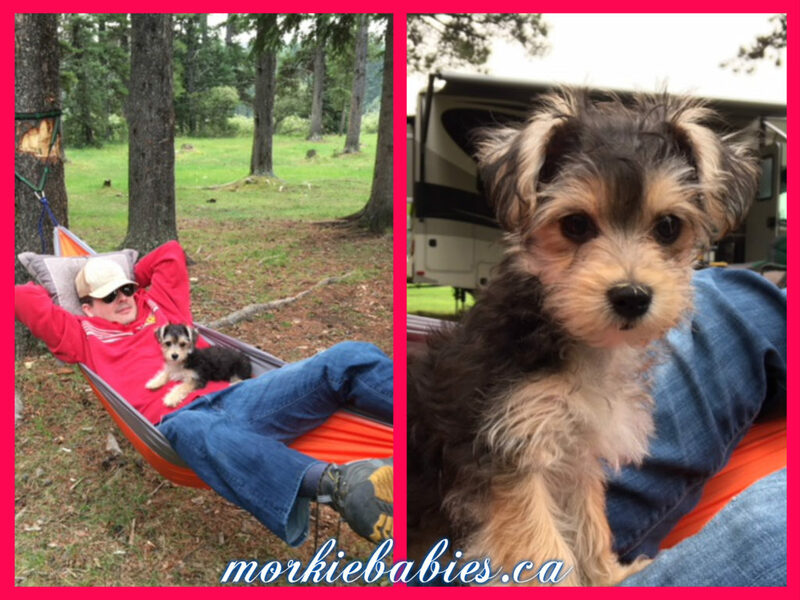 Have a great weekend Love Donna & Mia~New Westminister, B.C. Molly learning how to swim before the Summer starts.~Maryline~Victoria, B.C. Here is a photo of little Mia, first thing in the morning. 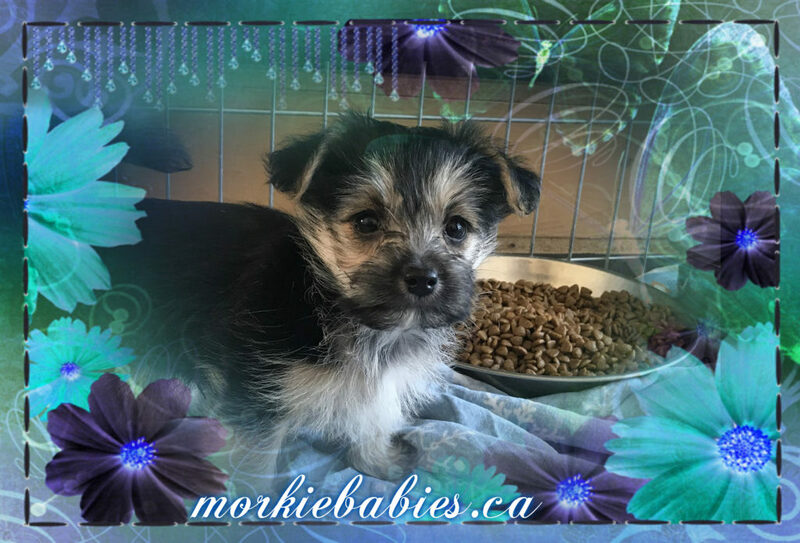 Adopted by~Donna of New Westminister, B.C. Hi Ruth: Apple is super great. Just wanted to let you know. She’s very comfortable around us and many of our friends have been visiting and she’s comfortable around people and kids. ~Melanie~Richmond, B.C. Molly got spayed today and was such a good girl! Now she’s got her little pj on. 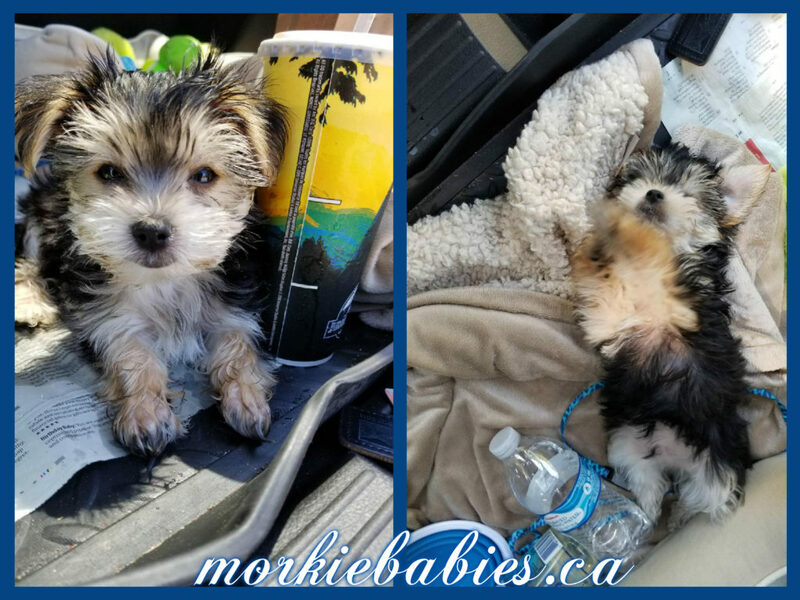 She still looks like a little doll, lol~Maryline~Victoria, B.C. She is so much fun and gives so much love and joy to us. Thank you, ~Jenny and Jeff~Vancouver, B.C. Hi Ruth, It is a small world. 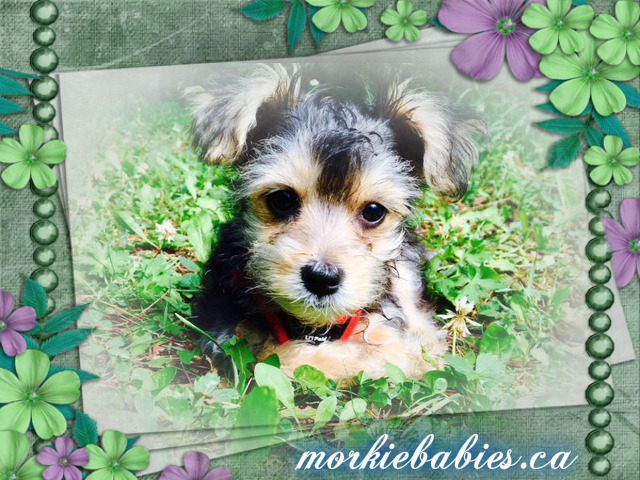 Today I was walking my “Morkie baby” Madi, in the woods & we met another of your babies. She was a tea cup one named Susie I think. Anyhow, she looked exactly like Madi only smaller. Got talking with the owner & they got theirs from you also. Both of us just love our little dogs!! 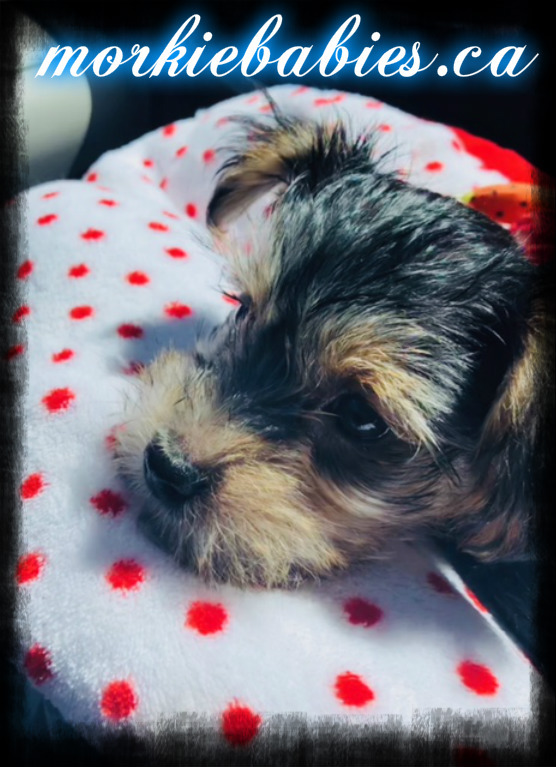 Thank you again for my baby….she is the best!!! I just happen to have numerous pics of Madi. She has lightened up a lot. She loves everyone & everyone thinks she is so cute & cuddly. I will recommend you to anyone!! 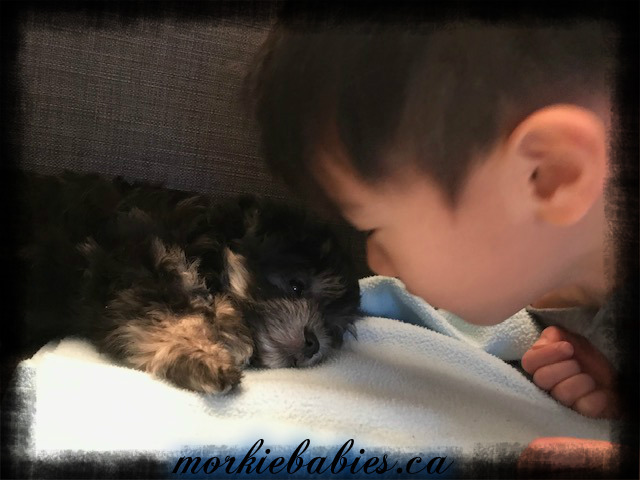 Love at first sight!~Sarah~Delta, B.C. Here’s a beautiful picture of Lexi, sent in today. “She’s doing so well! !”~Pamela~Kamloops, B.C. Hi Ruth: I’m in love with Molly. She’s doing great! She slept for most of the night, except when you gave her some water and put her on her pad to pee. This morning she had a little of dry food and a little of her wet food. She is currently playing. We had our Vet appointment yesterday and Molly is healthy. 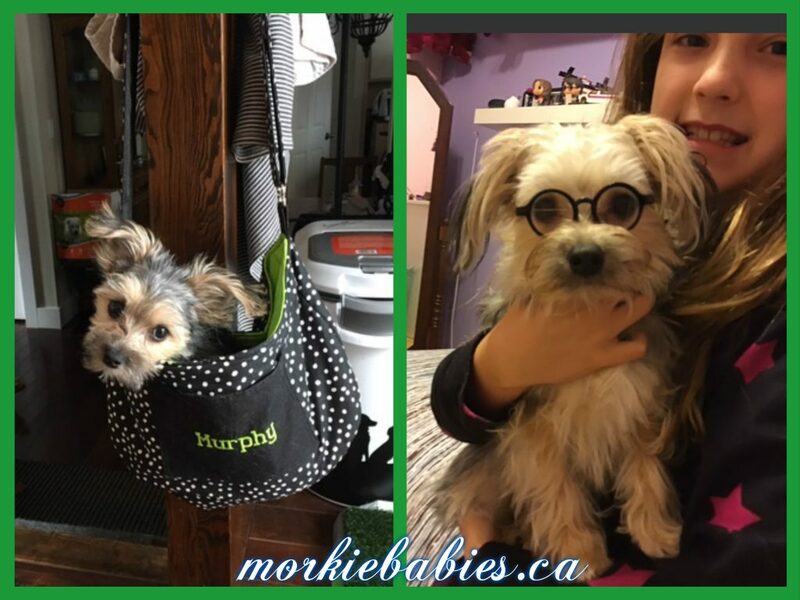 And I found a pouch similar to what you have and she loves it!~Maryline~Victoria, B.C. 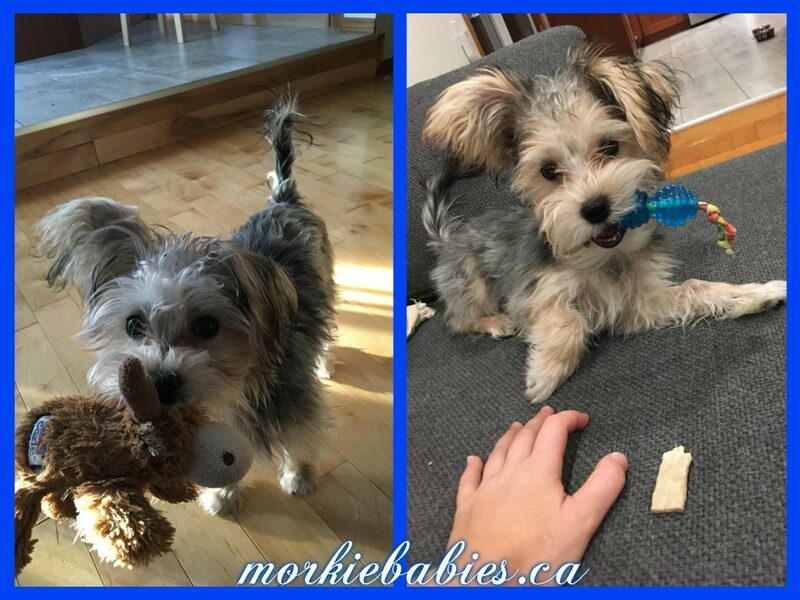 Another Cutie face of Morkie baby Apple 🙂~Melanie~Richmond, B.C. 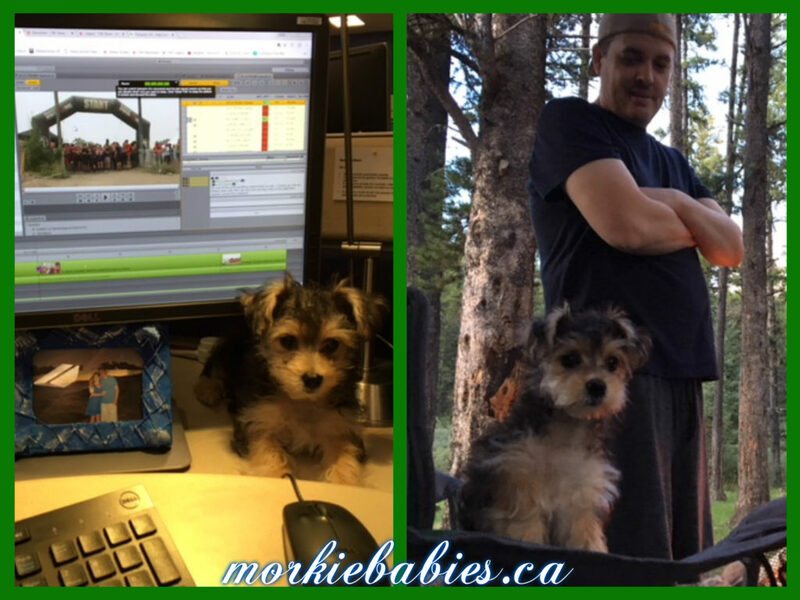 This video is super adorable of Apple!~Melanie~Richmond, B.C. MERRY CHRISTMAS! ~ Molly & Maryline ~Victoria, B.C. Thought you may enjoy this. Lucy’s first 6 months. We all adore her, even Hamilton. Lucy got spayed on Wed, all went well, she’s back to her old self. ~Karen~Trail, B.C. Hi Ruth, Just want to let you know that Apple is settling in very well. I take her around for walks around my apartment building. She knows where the potty is and is eating very well. Vet said she is great and perfectly healthy. We will see the vet again at 12 weeks. She’s doing so well. I am starting to understand her signs and personality. 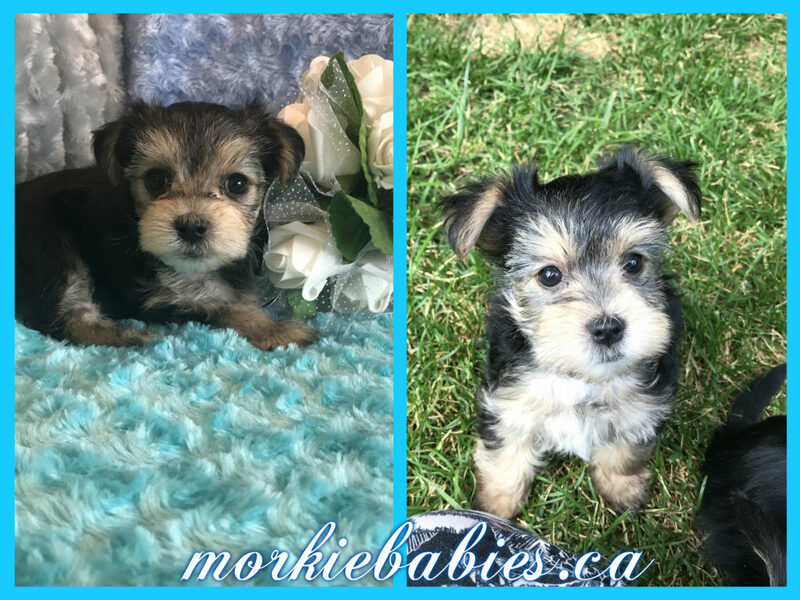 🙂 I’m so lucky!~Melanie~Richmond, B.C. Thank you so much for giving Murphy his first loves, his kindness and his temperament. He is lovely. ~Leanne~Richmond, B.C. Hi Ruth: Long time. How are you? Just wanted to share a few pictures of Daisy and Duke with you. They are doing great. 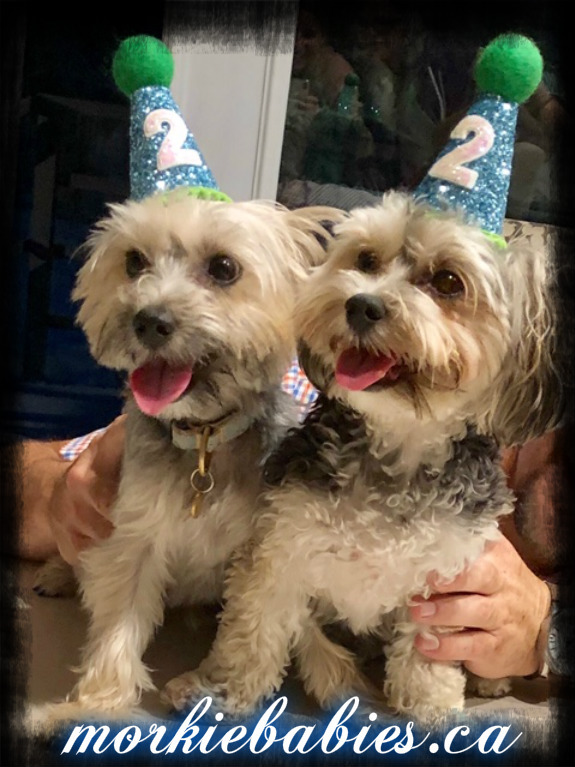 Hard to believe they are weeks away from their first birthdays. Ya, they’re pretty cute. Big snugglers. ~Dean & Laura~Surrey, B.C. I can’t believe Lily ( Santa is holding her up higher) is almost 2. She is an amazingly sweet, smart, funny and so loving. Thank-you! Have a Very Merry Christmas! ~Jenny-Leigh and Jeff~Vancouver, B.C. Murphy loves his pouch when we go walking. 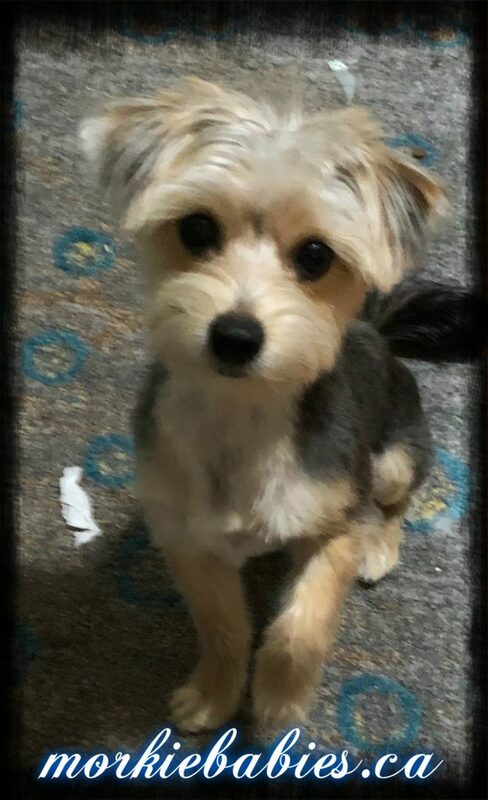 Murphy is now 6 lbs and just had his allover first cut. Spent last week camping and he loves to walk in the waters edge. Hates to be alone but we r working on that. 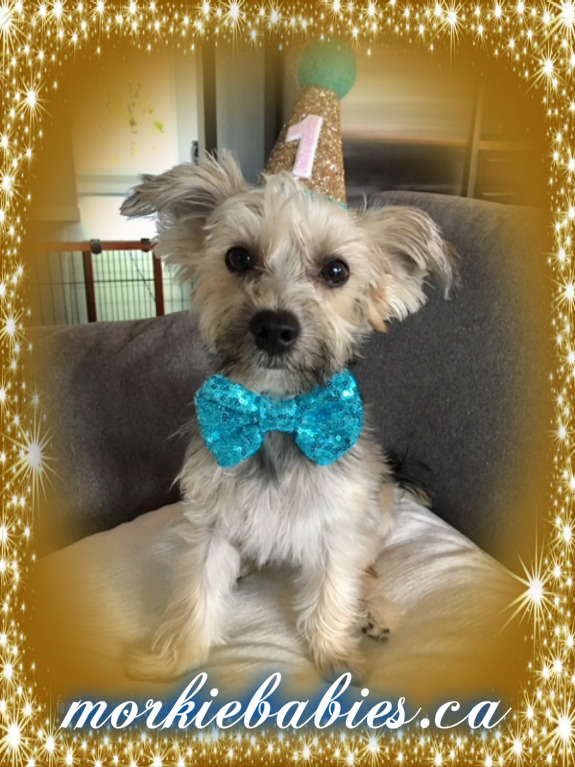 🙂 Our Murphy boy….1 year old. Glasses were edited on by my grand daughter. He is totally loved and sadly spoiled. 🙂~Pat~Parksville, B.C. 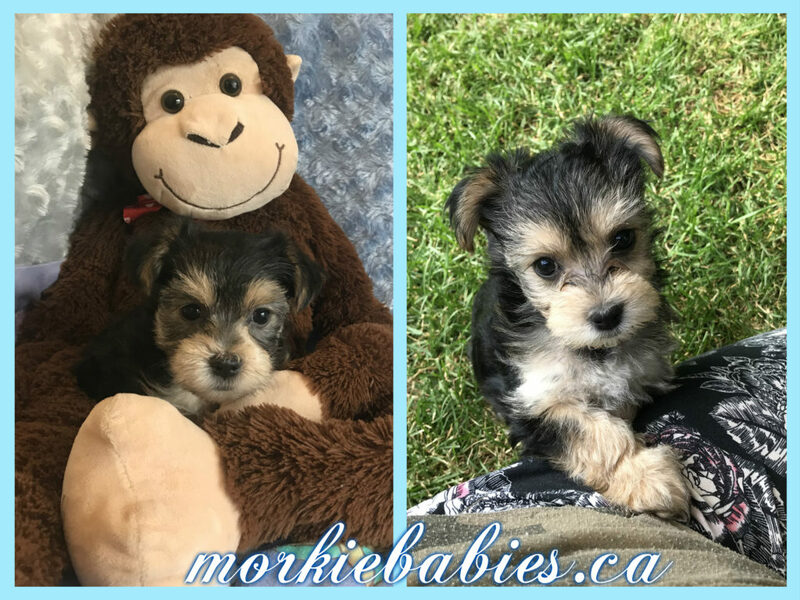 Classic Black & Tan Morkie baby Apple~Sold to Melanie of Richmond, B.C. 2. 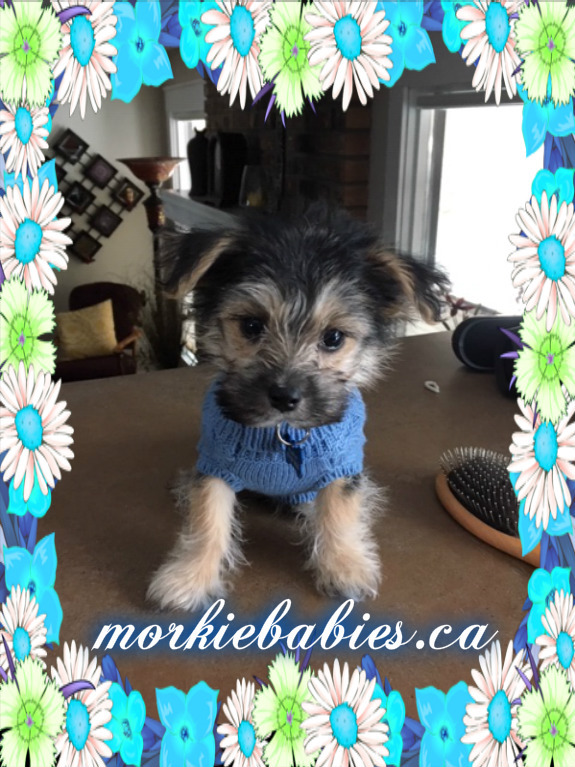 Classic Black & Tan Morkie baby Cookie~Sold to Carole & Chuck of Parksville, B.C. I thought I would let you know how Rafa is doing. He is 7 lbs. of fun. Rafa is a great little puppy. He loves to play, we go for long walks and he can be off leash whenever we are away from roads. 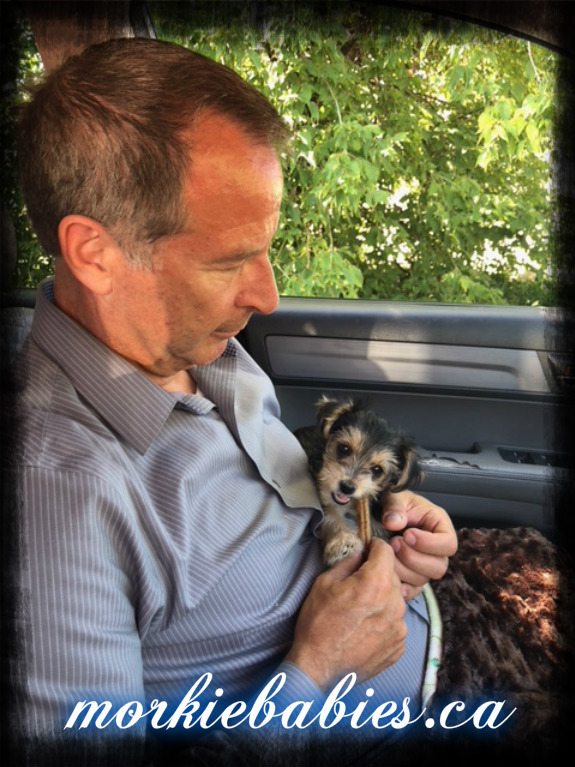 My husband has grown quite fond of the little guy and everybody loves Rafa. He is just so cute. He listens, knows all his basic commands and I am slowly getting him ready for some agility training. I am so glad I decided to get a dog, and Rafa has proven to be a delightful little companion. Thank you Ruth for being such a wonderful breeder. Rafa is a healthy dog, his coat is sooooo soft. I keep it short now because he is always in the garden or walking or rolling in something. He is nothing short of adorable. Thanks ever so much for approving me as an owner. We realized that it was Jasper’s 6 month birthday last week and wanted to let you know how amazing he’s doing. He is the most playful, adorable and intelligent dog. We absolutely love him and are so thankful that we have such a perfect addition to our family. He’s been sleeping through the night for a couple months and is fully potty trained. He is able to sit on command, has almost got stay and come down pat (when he wants to) and is learning to shake a paw. He loves walks and plays really well with other dogs. He is comfortable visiting new places, loves our families and friends, and is patient with my young nephews. 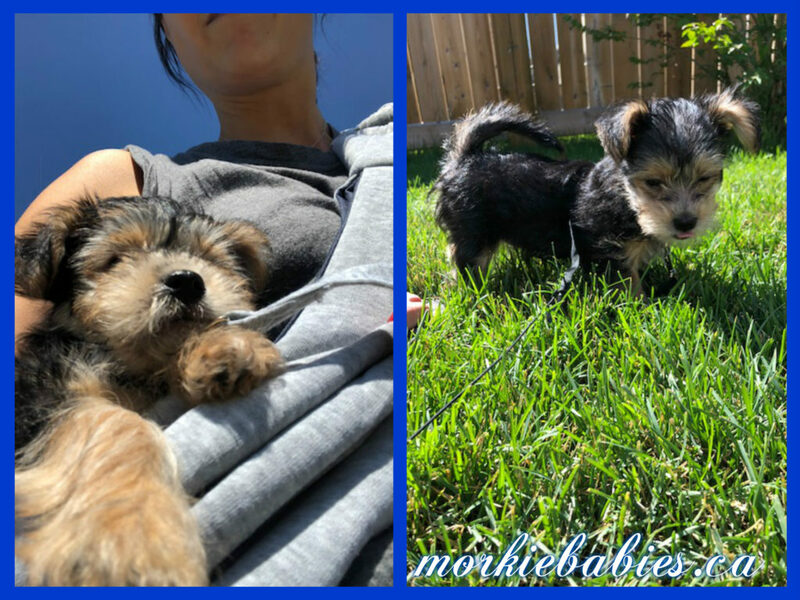 He is so full of energy and has a big personality for a little guy. He makes us laugh and smile constantly. He’s very healthy and is such a well-adjusted little guy. Other than car rides nothing seems to bother him. He LOVES romping in the snow. I’ve attached some recent pictures of him with his handsome silver fur. Thank you so much for taking care to breed such happy and healthy puppies. 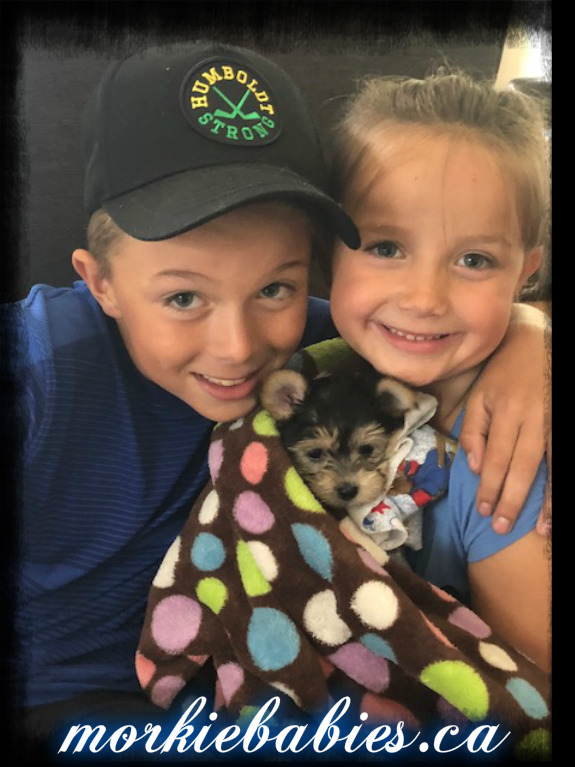 He is everything we dreamed of in a dog and more, we are so grateful for the work you do with the parents and puppies. I hope that you are having a nice end of fall/start of winter. Enjoy the holiday season, I can’t believe how fast it’s coming up. Hello Ruth! I thought I’d send you a quick update on our Roo. She continues to be the center of our lives, and loves to come to work. She prefers to sit right on my desk like a stuffed toy and watch me edit videos. Everyone gets a hoot out of it. She also loves everything about camping-especially the mud! Roo’s a digger who loves to collect sticks, go on forest walks, sleep in front of the campfire, and dive into any sort of water. She thinks she’s a Labrador! She also just got her recent vaccinations and another clean bill of health. She continues to eat REALLY well and is now a solid 4 pounds. She’s learned how to sit on command and lie down. She’s big enough to jump onto couches and beds and do stairs all by herself so she keeps us hopping and we’re loving it. Roo’s truly fearless about the world around her. She starts Obedience classes next week to help her socialize more and learn how to not bark so much when we tell her “no”-definitely a little Alpha! Anyway, she’s a Sweetheart. She makes us so happy. Just another check in from Charlie. She is basically 80 percent potty trained and I took her for her second set of vaccinations and the vet said that he is very pleased with how healthy she is. When I’m home I let her have free range of the house and she never gets into anything she shouldn’t. Today she went missing for an hour upstairs so I went to check on her and she was chilling out with a bone. Charlie has so much personality but is so well behaved. 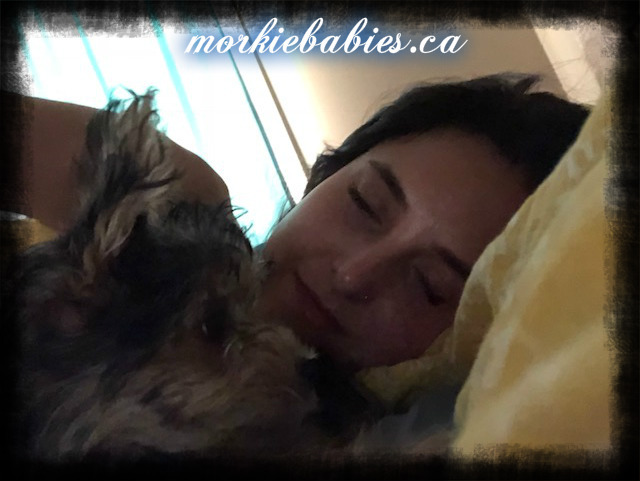 I’m going to message you again in the Spring because we will be moving into a bigger house and will want a buddy for our Baby Baby Boo Boo (Charlie lol). Just one more thing….no one believes us when we say she sleeps through the night. I guess that isn’t very common with puppies but she sleeps like an Angel. And then in the morning I bring her to bed with me and she sleeps even longer, lol. Thanks, Ruth…. I have so many friends who have had puppies from breeders but no one has had as good an experience as me. My boyfriend was very hesitant because he had a very bad experience in the past. But right away he fell in love and was shocked by how well behaved and adjusted she is. We are so in love and I’m already anxious about going back to work. Charlie will even sometimes choose to go to play in the pen den area, so I”m hoping she will be ok when we leave her. I’m hiring a dog walker to come at lunch to play with her while I’m gone. We are just so happy with Charlie. Honestly she is the love of our life. We won’t be having children so she is our little baby. Next year there will be 2. 🙂 Oh wait….one more picture….my friend donated all of her old boy puppy clothes to me. I feel like she could model. 🙂 Anyways, thank you, you really are so amazing and we can’t wait to adopt again. Hi Ruth, just a quick note to let you know little Roo is doing great! She’s running and jumping and talking with confidence now and developing quite a distinct personality-we just love her. Hello Ruth, Mia now is just over two years old; she is just a bundle of joy but some trying times. Hi Ruth, Just wanted to give you a quick update. Charlie is doing amazing. She has only made a couple accidents in the house and is well on her way to be potty trained. She sleeps through the night and has the best little personality. She is so well behaved, we can’t believe it. She gets attention everywhere we go and everyone tells me she is the cutest thing they have ever seen. 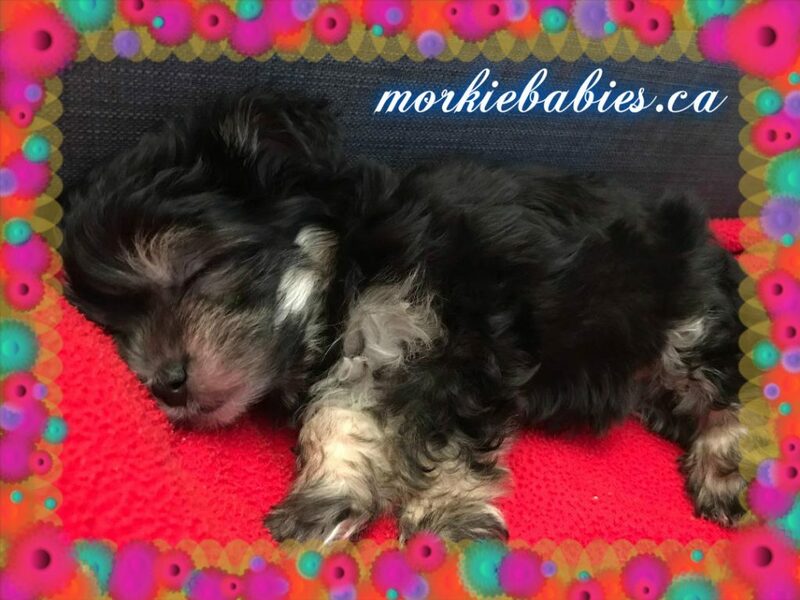 Our neighbors even want a morkie now. 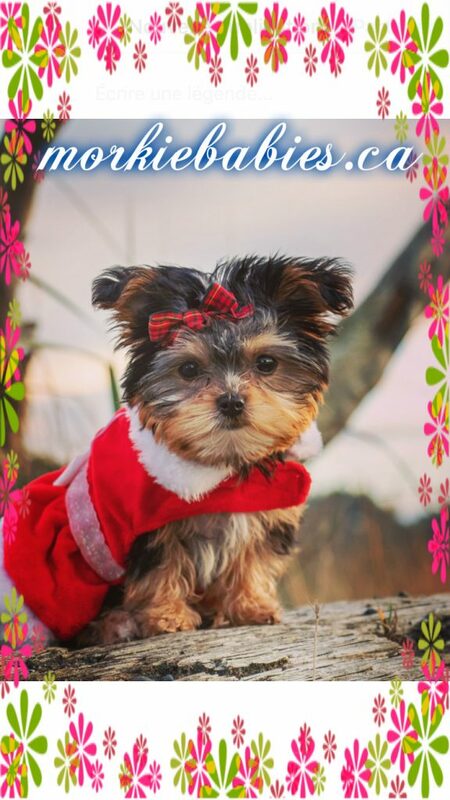 She is my little baby boo lol….Thanks again for all of your help. 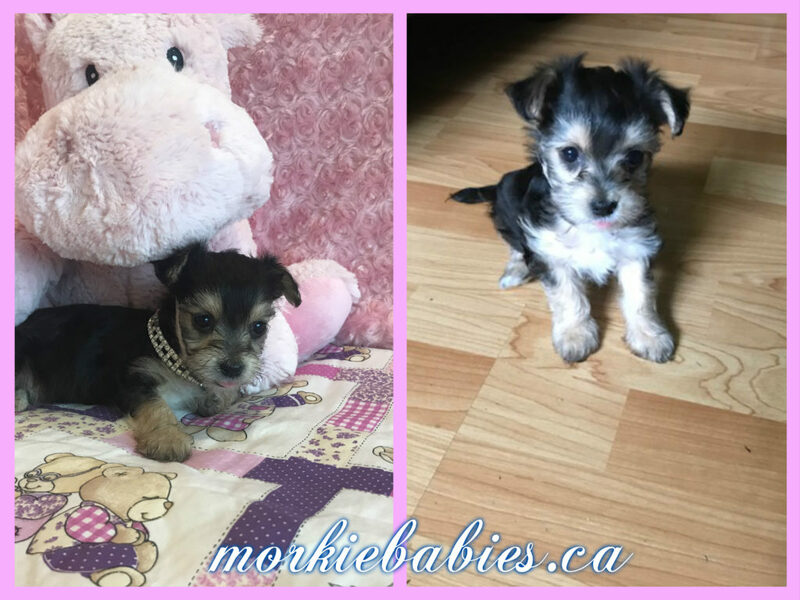 Baby Ruby Roo was the first Morkie baby to leave for her new home in Edmonton! Hi Ruth, just a quick note to say it’s been a great first week together with Roo~she’s settling in and making herself at home. She loves to race around the condo and wrestle with her octopus. 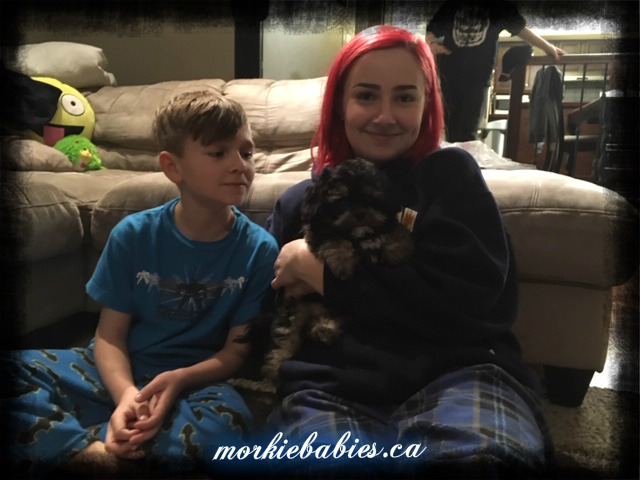 Jasper was the second Morkie baby to leave for his new home in Alberta! Hi Ruth, I just wanted to update you on how amazing Jasper is doing! He had a vet checkup yesterday and is in excellent shape. He’s been doing his business outside or on the paper, eating well, and is just so smart and loving that we can’t believe he’s real! 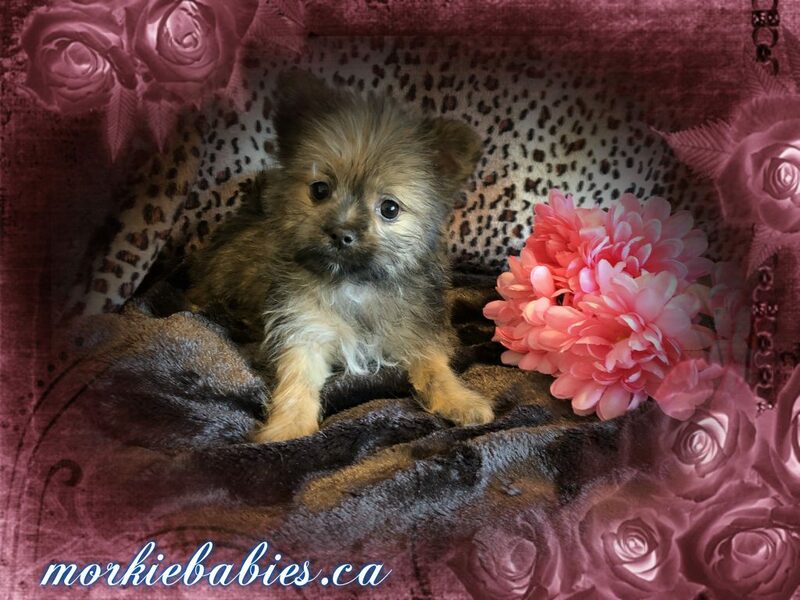 3) Charlie~ is *SOLD* to Lara & family of Fort Saskatchewan! 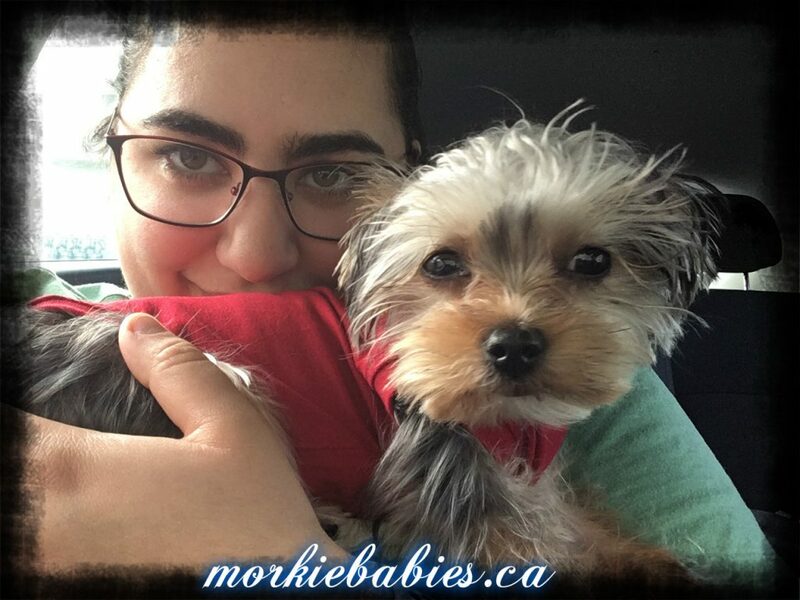 Charlie was the third Morkie baby to leave for her new home in Saskatchewan! 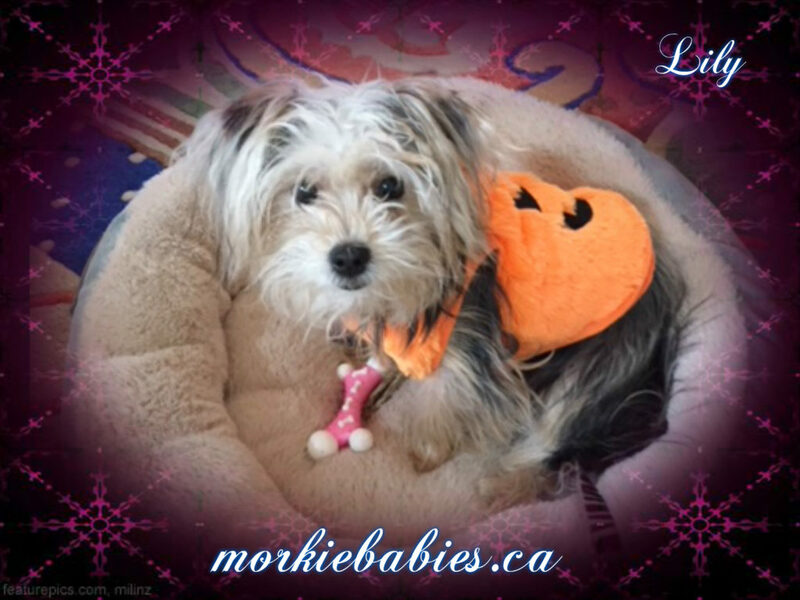 5) Lucy~ is *SOLD* Karen of Trail, B.C.~Karen has one of our morkie babies~Hamilton. That’s why they end up being well adjusted dogs. So much like children in many ways.~Karen~Trail, B.C. 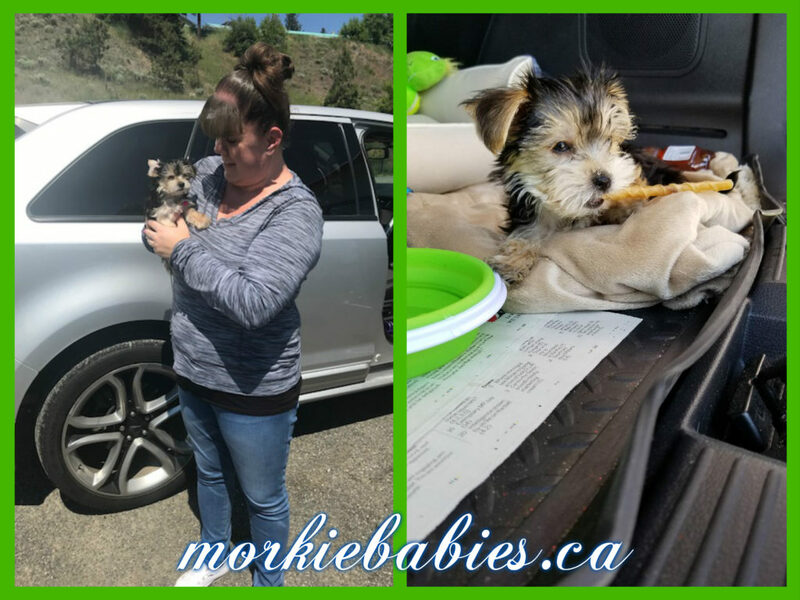 Lucy was the fourth Morkie baby to leave for her new home in Trail, B.C.! We have been sitting here with her and she is already warming up to us, and licking my nose. She is wonderful. She is playing with us, ate well, and even had a romp before bedtime. You did an amazing job. ~Karen~Trail, B.C. 4) Lucas~ is *SOLD* to Ed & family of Vancouver, B.C. ~Ed has one of our babies~ Lucy. Lucas is doing great. He’s getting accustomed to us, but it looks like it’s going well. He’s very very cute. We walked with him and everyone stopped to look at him! Adorable. 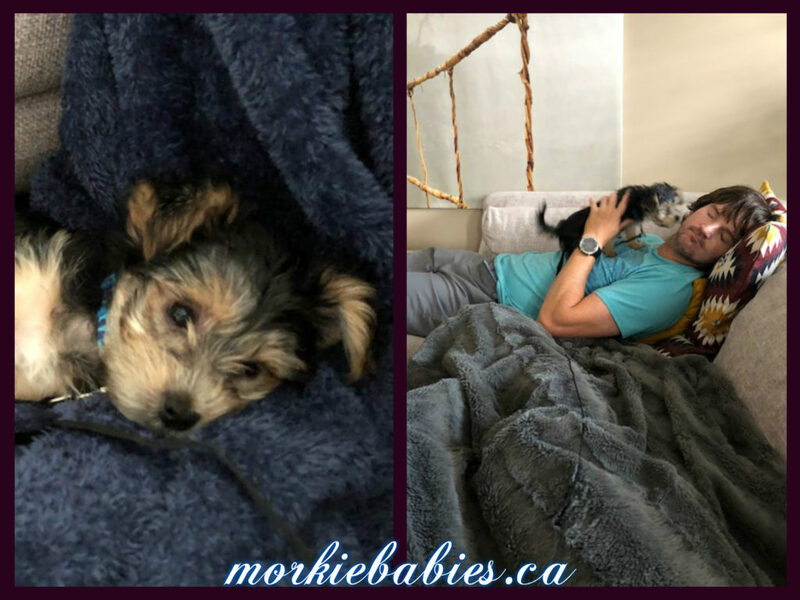 Thanks so much for letting us give him a home!~Ed~Vancouver, B.C. 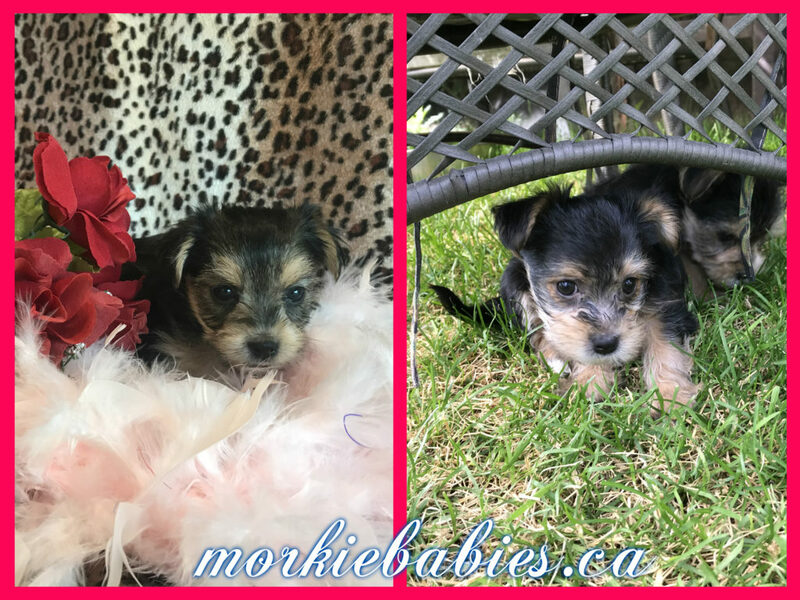 Another round of Super Healthy puppies!!! ♥ They were little Angels at the Vets. 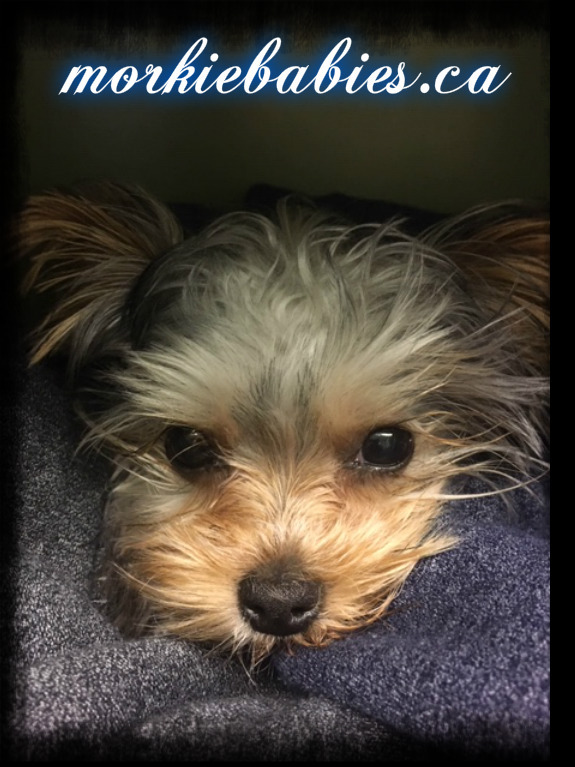 Lexi is doing wonderful!!!! Still getting their hour walk with their Dad every morning. Then every other day I take them again for 1/2 hr. They love being outside, and when they get tired, well you can see what they do, when we are still outside. Love love all your new litters! Take care, Pam~Vernon, B.C. 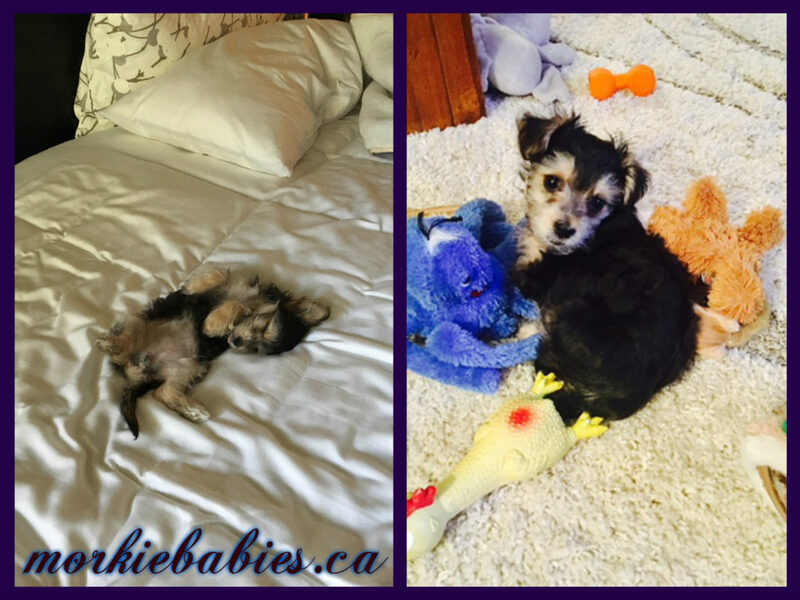 Zoey was our first Morkie baby to leave the nest. Here’s first baby Zoey with her two new best friends in her new home. 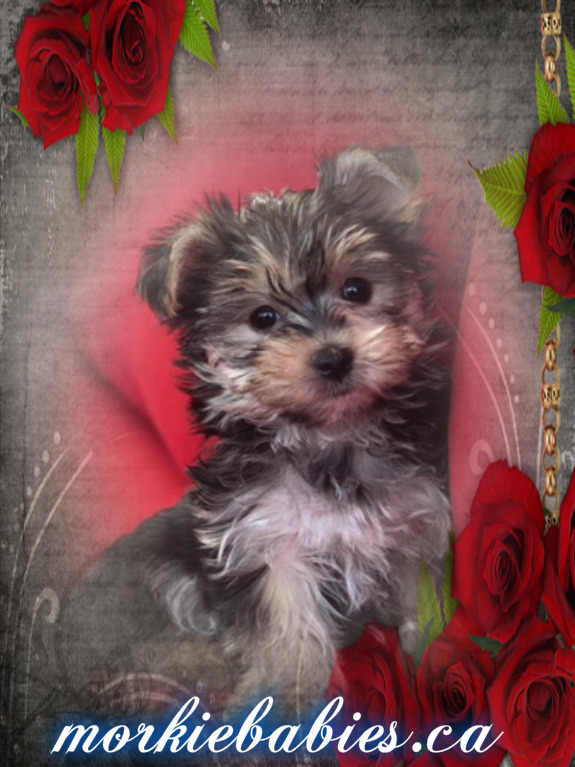 Ruby-renamed Zoe~ * SOLD* to Ginger of Coquitlam, B.C. So far, so good! Here’s second baby Zoe of our litter posing in her new home. Thanks Ginger! 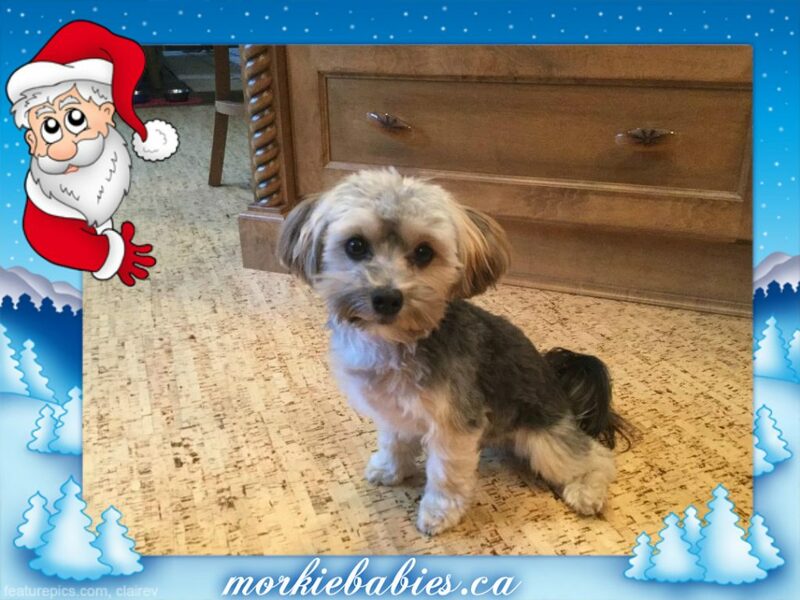 Elfie was the third Morkie baby to leave the litter. Here’s a photo of him with his new and VERY happy family. 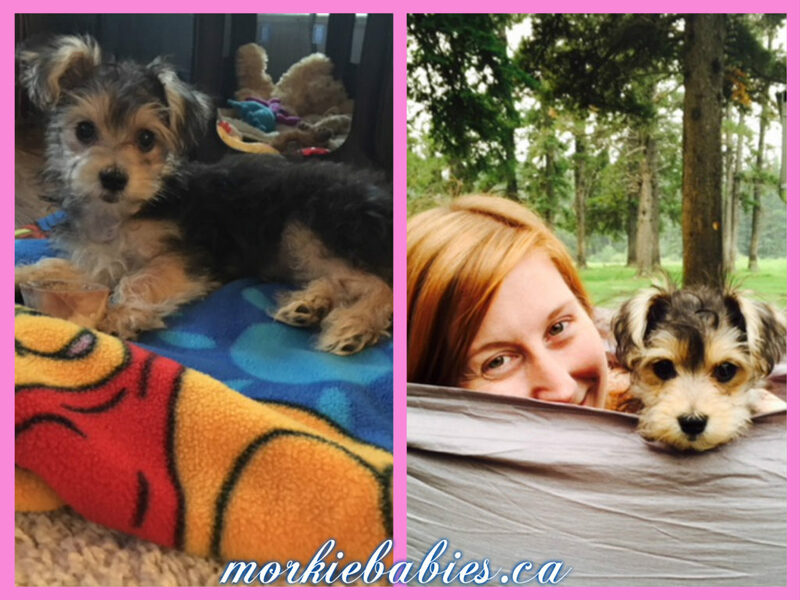 Jojo was our fourth Morkie baby to leave the litter, and Lori traveled all this way to get her! Hi Ruth: We made it home & Jo Jo has settled right in. Thought I would touch base, her little personality is coming out. She responds to her name & already sits & fetches her little ball. 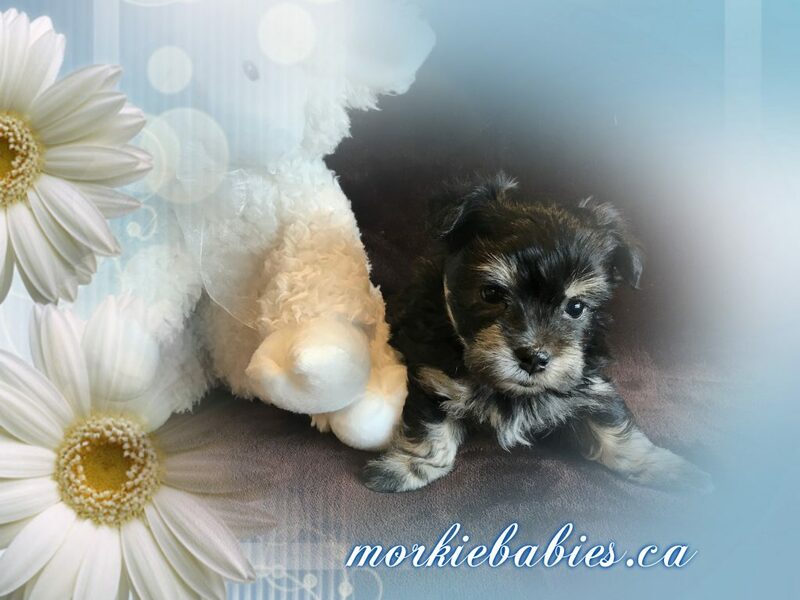 Teddy Bear Morkie baby boy Otto (now named Ollie) is *SOLD* to Kassie & family of Langley, B.C. 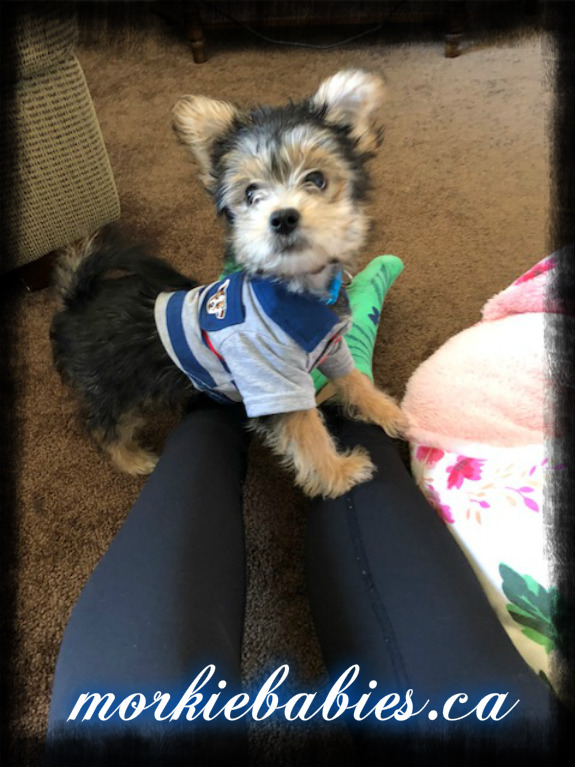 Here is Baby Ollie meeting his new Mommy, Kassie…. He is the cutest little guy ever, oh my goodness. Thank you so much for everything. I can’t thank you enough. 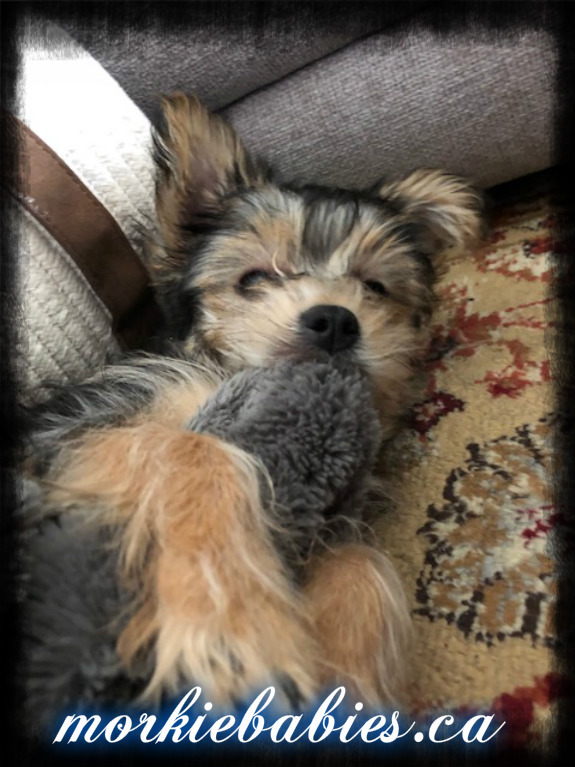 He’s been eating and drinking and peeing….one poop so far….he’s so playful and happy, yet calm. He is sleeping on my chest right now with his head resting on my shoulder. 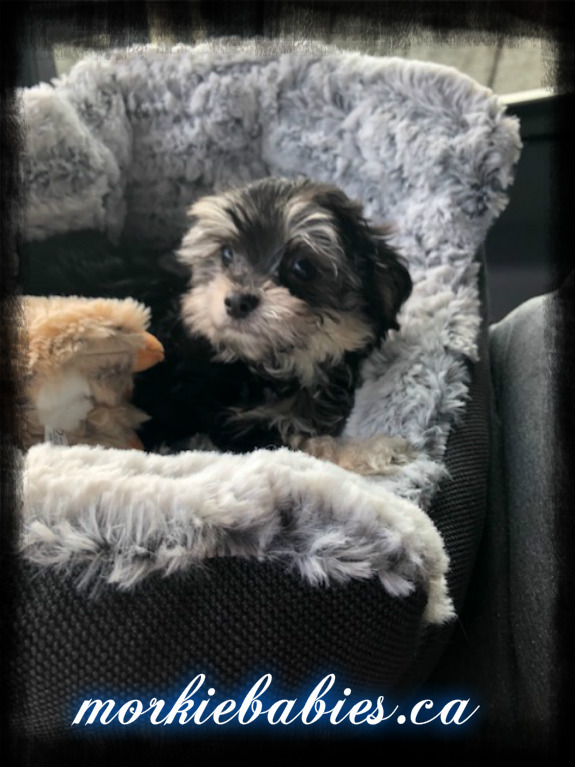 I’m surprising my daughter tomorrow with him. He’s such a little ham….He’s played right out. My two girlfriends were shocked how calm and happy he is. No shaking or shivering or making shy to anyone. He’s doing so awesome. You’ve done a wonderful job! ~Kassie~Langley, B.C. Good Morning; Well, he made it through the first night like a Champ. He’s still sleeping. I let him out at 6 am for a pee and he went right back to sleep. I may have had him sleep with me the whole night. I couldn’t leave him on the floor in my bedroom last night and he settled right in on my bed once I put him there. My parents couldn’t believe how calm and friendly he is….he’s just perfect. We stopped at the DQ in Cache Creek and he got the attention of everyone who walked by my car. 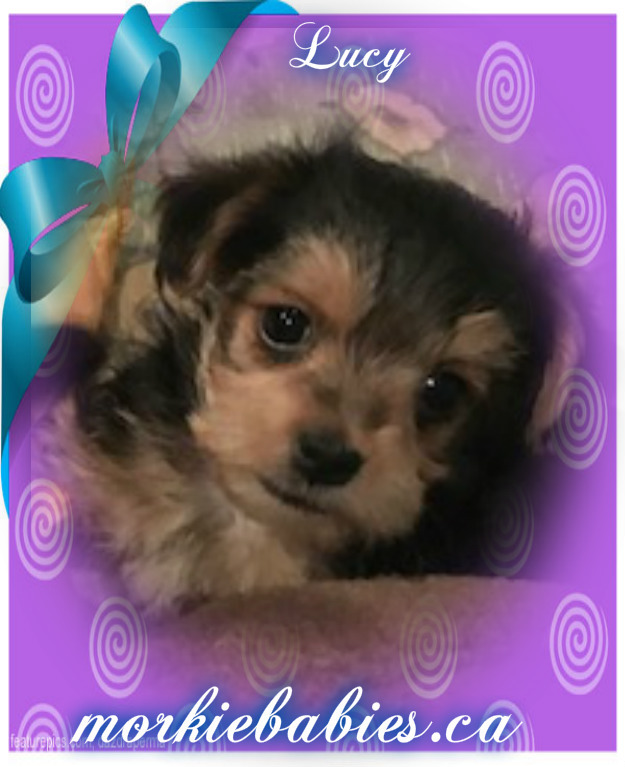 I’m sure I will have people interested….I know my parents are over the moon about him, lol…. He loves slippers and socks and shoe laces, lol,loves the back yard. He’s exploring right now.~Kassie~Langley, B.C. I’m surprising my daughter shortly with him…..it went great. 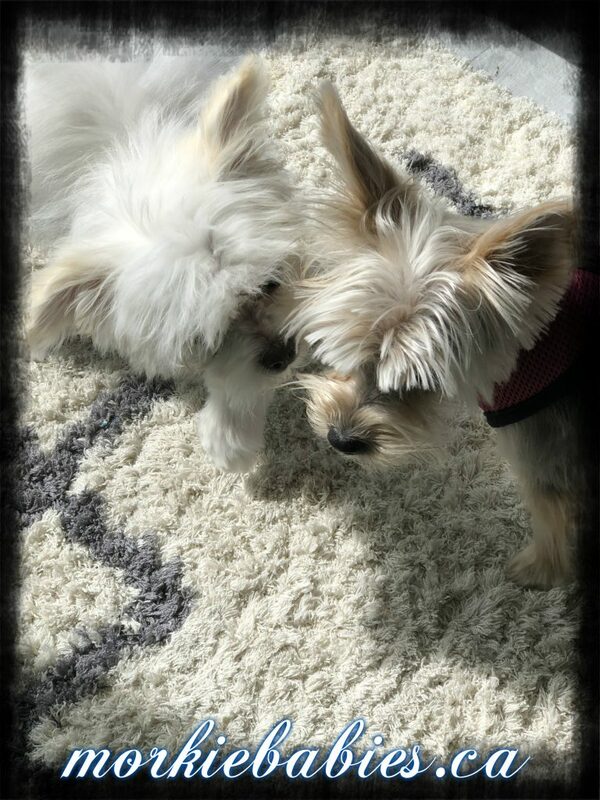 She just loves him and he is all over her giving her kisses….he’s such a ham!!! Thank you. 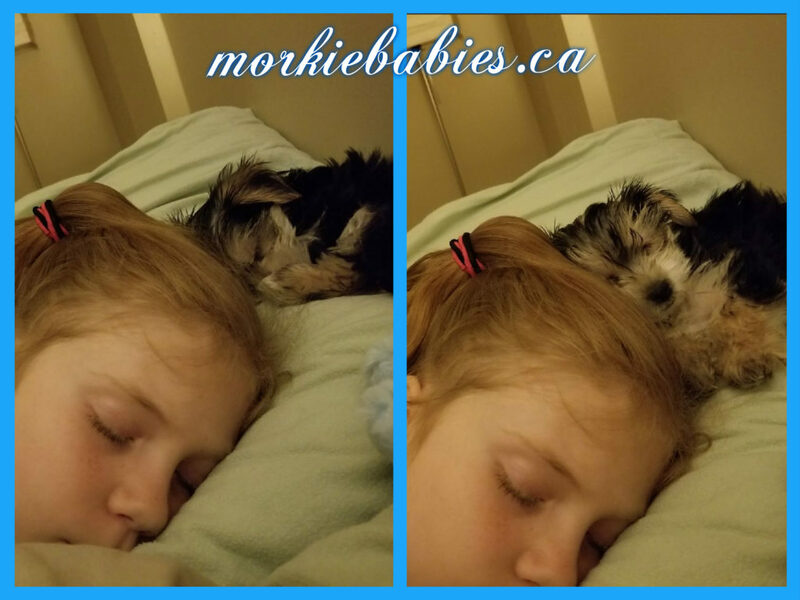 He’s sleeping on her pillow right beside her head. I think he likes her! He took to her right away. I’ve never come across a puppy quite like him. His disposition is like no other. So loving! My little puppy is now five months old. He is a lot of fun….quite active, very affectionate, cheeky too! Rafa is a smart little dog and his trainer (or should I say my trainer) has nothing but compliments about him. He is a very healthy dog and his coat is so soft and lustrous. You are a good breeder Ruth and Rafa is a great testament to your care. I just got Rafa clipped and thought you might like to see a picture of him. I am so glad I got this pup, even though I think raising a child is easier. Rafa is being neutered this month and i am going to get a chip put in. All the best,~Kathleen~Vancouver, B.C. 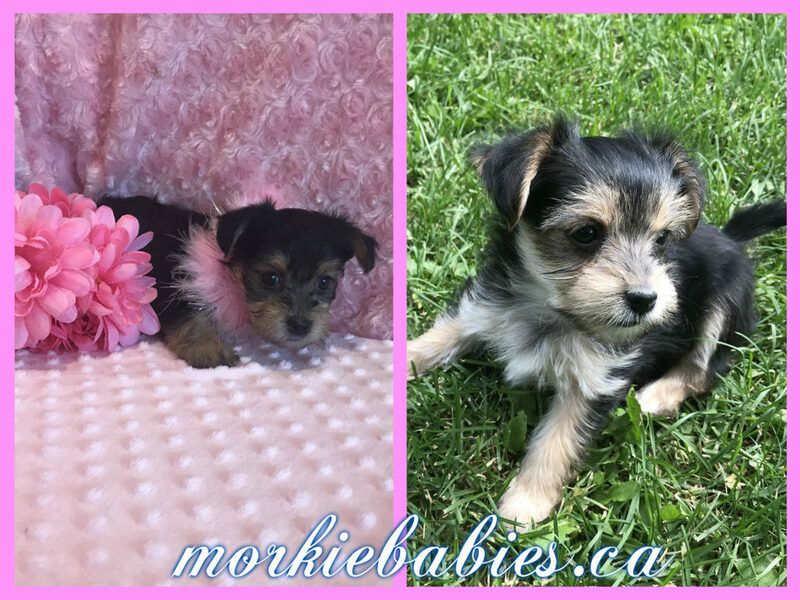 ~Classic Black & Tan color~Murphy~RESERVED FOR PATTY OF PRINCE GEORGE, B.C. Hi Ruth! I hope you and your family are doing SO well! This is Silvia, Francesco #2’s mom! 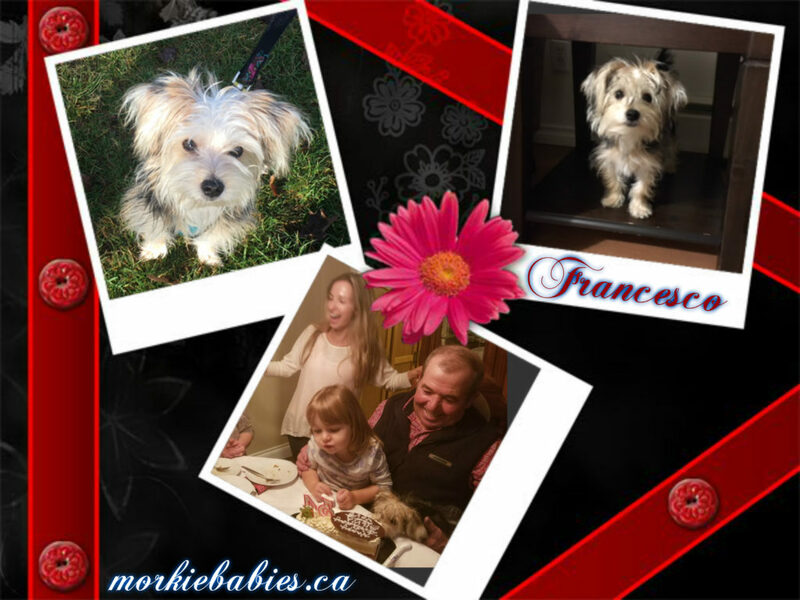 Oh my goodness, Francesco has changed our entire family and extended family’s lives!!! Hehe…. He is the biggest cutie and everyone is soooo in love. You make the most perfect little darlings. 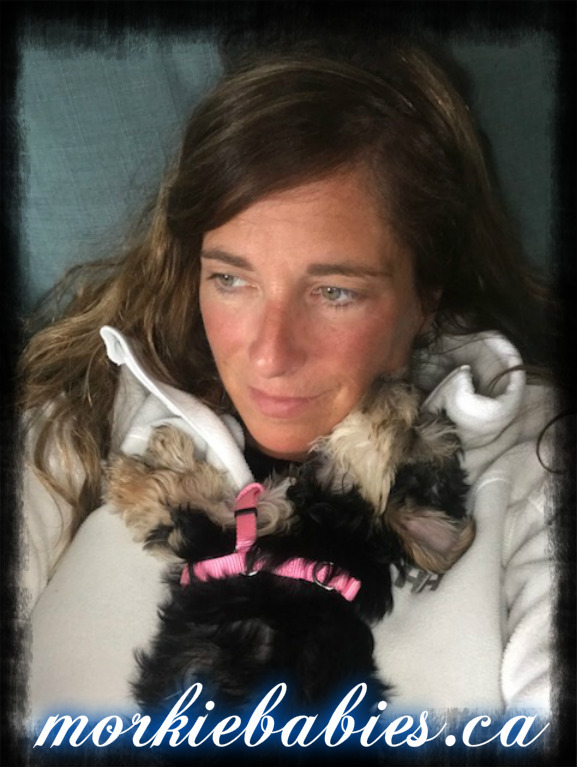 My aunt and cousin (also soooo in love with Francesco) are considering getting their own little pup. the reason we are all cracking up is because we just noticed Francesco licking the icing off the birthday cake secretly!!!! Bwahahaha….He is in the bottom right hand corner trying to lick the cake. lol…He is the absolute BEST. ♥~Silvia & family~New Westminister, B.C. 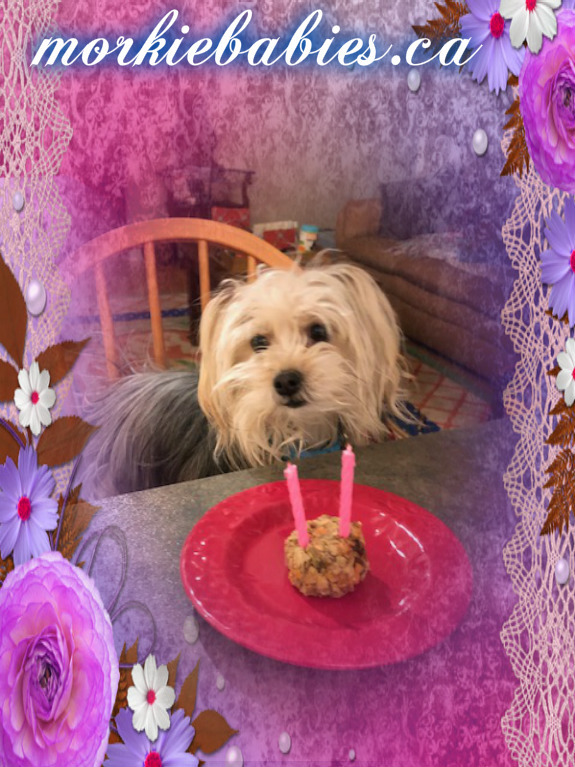 Lily’s 1st Birthday! 1st pic she was too low so the other 2 she is up on a cushion. Lily is an Amazing girl (beautiful, funny, smart, loving) and of course she is so totally loved. I find it hard to believe that she is 1 yr old. Lily was so unsure as to why she was on a chair. I will try to do the same each year, it will be cute to look back on and she will get to know what it is all about. Thank you.~Jenny~Vancouver, B.C. 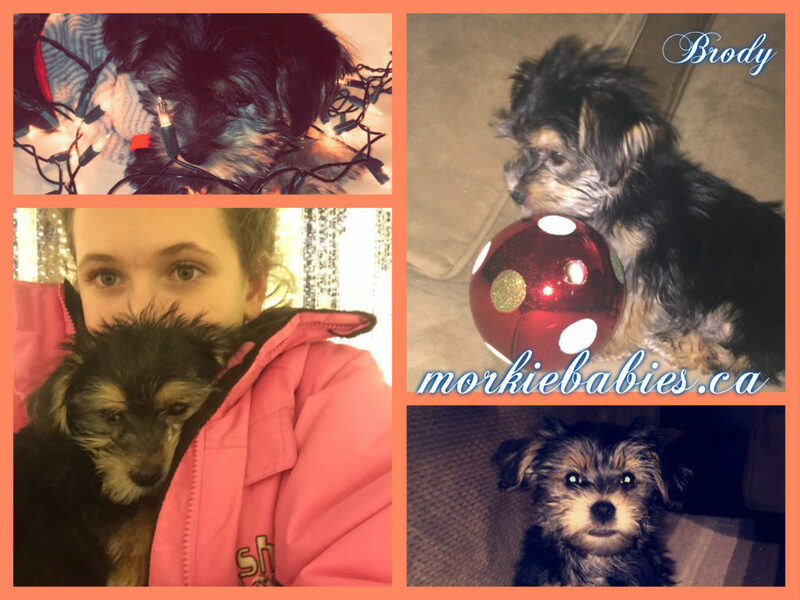 Hi Ruth: I just wanted to thank you again, for the most adorable and wonderful baby Morkie baby ever! 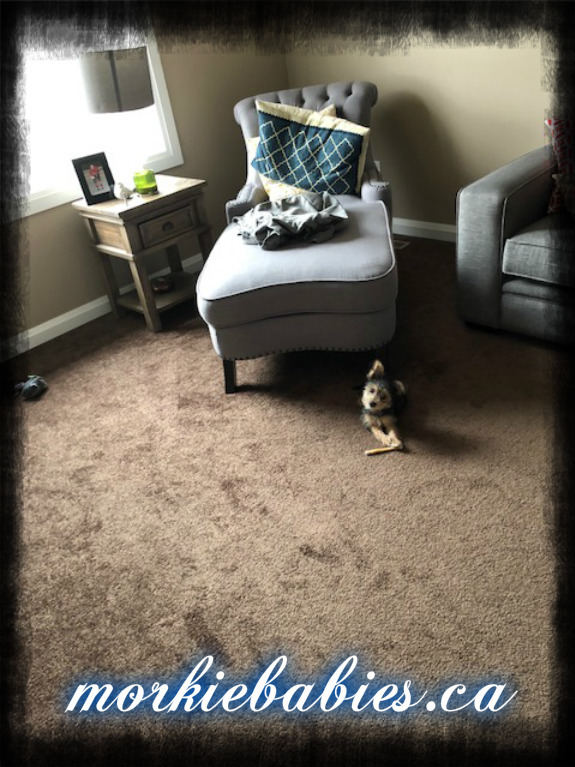 She has the cutest little Teddy bear face like you said, and I really appreciated you allowing us to your home for a visit to see the puppies and your pet family. I was astonished at how well behaved your dogs were, and also going over the grooming tips you gave us. We liked the family atmosphere, and you not rushing us out the door….. Maggie was meant to be for us. We have been looking over a lot of ads for the perfect puppy for about a year now. We will definitely give you a reference any time!! Thank you for the book on training, and all of the little goodies. Maggie is spoiled already. She also sleeps through the night, and has been doing potty on the papers and we are introducing her to our outside, and she likes it! So, thank you , thank you and thank you! Hi Ruth~ Perfect health examination. He didn’t make a noise with the injections. We love him. Thank you very much for gifting us with him. ~Gina~Vancouver, B.C. 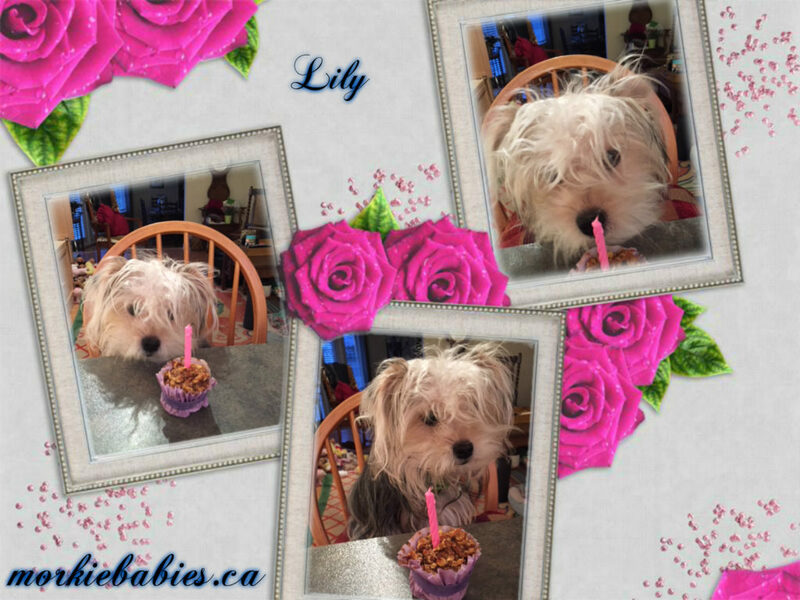 Hi Ruth, Here are some pics of Lily and Lola. 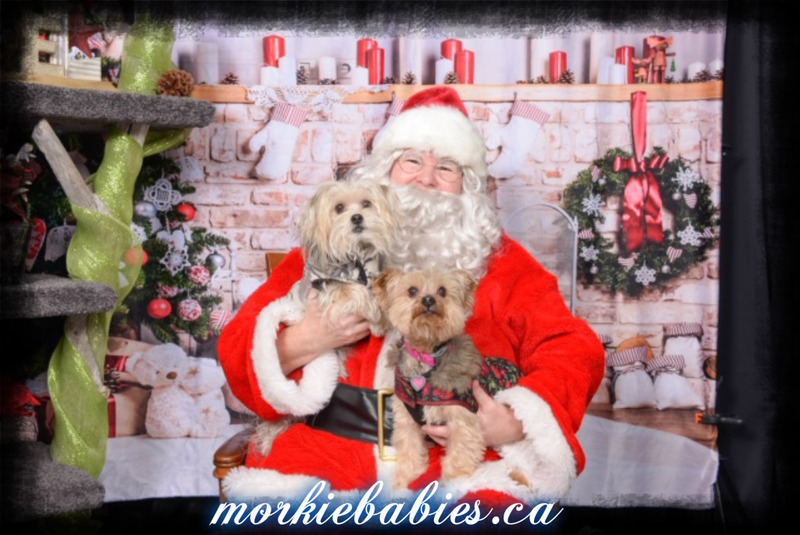 One is with her ‘pumpkin’ coat, another while visiting a girlfriend, and of course ‘a visit with Santa. Lily is so loved. It’s hard to put into words how much. She is smart, funny and is so full of love. Thank-you! She is very beautiful. She seems to enjoy being combed (as long as we don’t find any tangles). I imagine she could turn silver? What ever colour, she is perfect. We hope you have a really good Christmas, health and happiness in the New Year!~Jenny~Leigh~Vancouver, B.C. Hi Ruth, we are settling back into Edmonton. Ella is so good. She just cuddled and slept for the trip home. We are already so in love and can’t believe what a great dog she is. She did very well her first night. She only whined for about a minute and then settled into her bed for the night. She’s been running around this morning exploring. She seems to be pretty happy and loves lots of cuddles. She likes to drag all the toys to the blanket, ha ha…. She is very sweet and is very active today. We just love her! And I heard her brother did well last night as well! Nikki and I look forward to getting the two puppies together in the future. I’ll continue to update you as she settles in over the next few days. She likes to sleep on the laundry while I try and fold it and she has been going to puppy classes which she loves. I’ll be sure to send more photos in the future. Thanks Ruth! 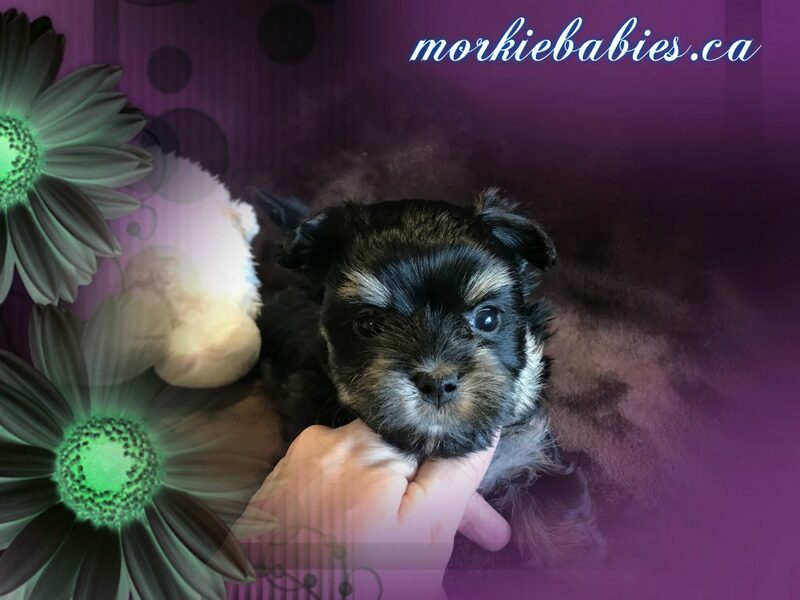 This tiny little Classic Black & Tan Morkie girl is now sold to Treena of Campbell River. 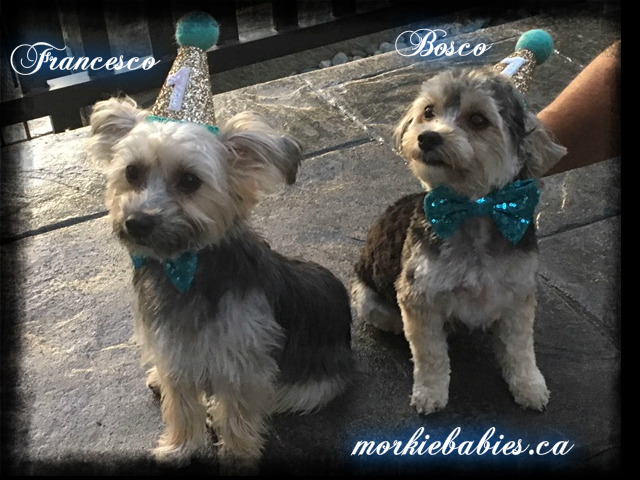 Hi Ruth 🙂 Here are a few pictures of Francesco and Bosco celebrating their Birthday. ~Kat~Burnaby, B.C. 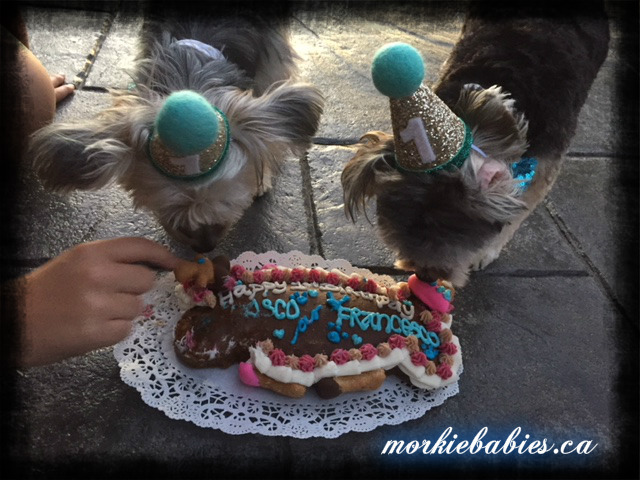 Francesco on his 1st Birthday. ~Kat~Burnaby, B.C. 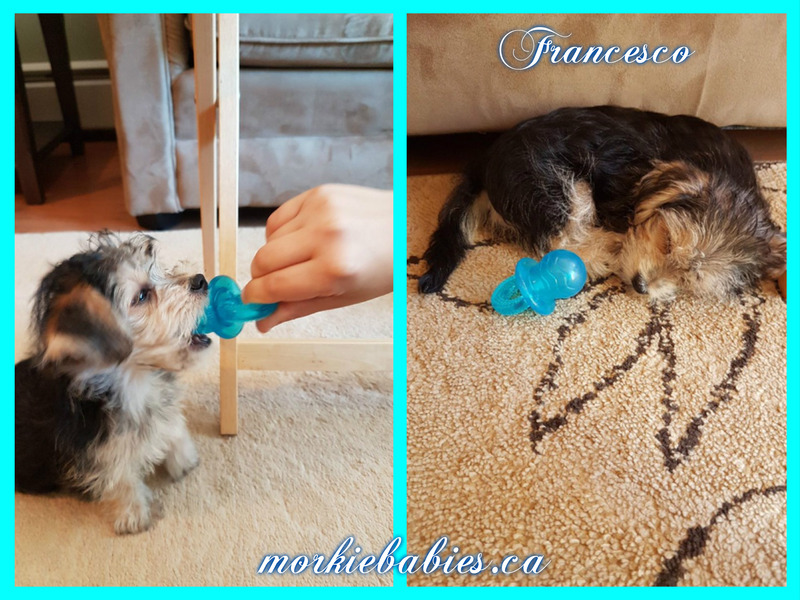 Francesco got some new toys from his cousins! he he…. (my cousins 10 year old twin girls). He is doing so well!! ♥ Silvia~ Vancouver, B.C. Lily continues to bring Joy to my life and she has become a loved member of my building. Many offers to co-parent her. She is doing great, eating well and she passed her screen with the Vet with flying colors. Thanks for everything Ruth, you do a great job. Here’s my girl. She is such a Joy.~Roberta~Edmonton, Alberta. He is so good! He got lots of activity and is fast asleep now. Has been peeing on grass or newspaper. Had one good poop. Hasn’t eaten too much though. But we encouraged fluids and he did drink okey. So cuddly!!! Melts our hearts. ♥ You have been amazing , Ruth. And have trained them so well! 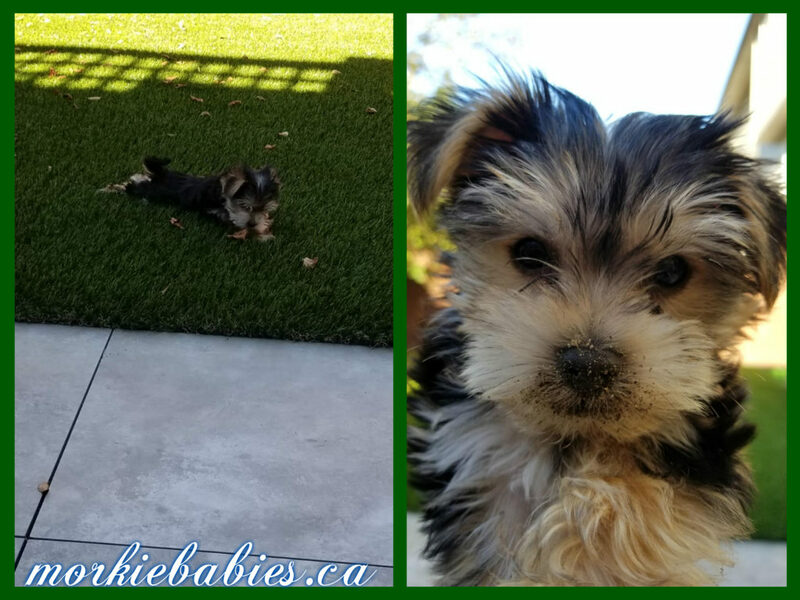 I am in awe….he has only peed on newspaper or on the grass! LOL…. I will continue to send you updates, and will likely have questions too. Francesco is the cutest EVER! We have a big area rug and he wouldn’t leave the boundaries of it, scared to go on the hardwood. But now he is a brave boy and exploring everywhere! He is very attached to Kai 🙂 Potty training continues to go well! Such a good boy. We are in LOVE. ♥ Thank you so much. 🙂 He is THE CUTEST !!!!! We all love him sooooo much. ♥♥ You raise the most precious, sweetest babies! So nice to meet you and your husband! 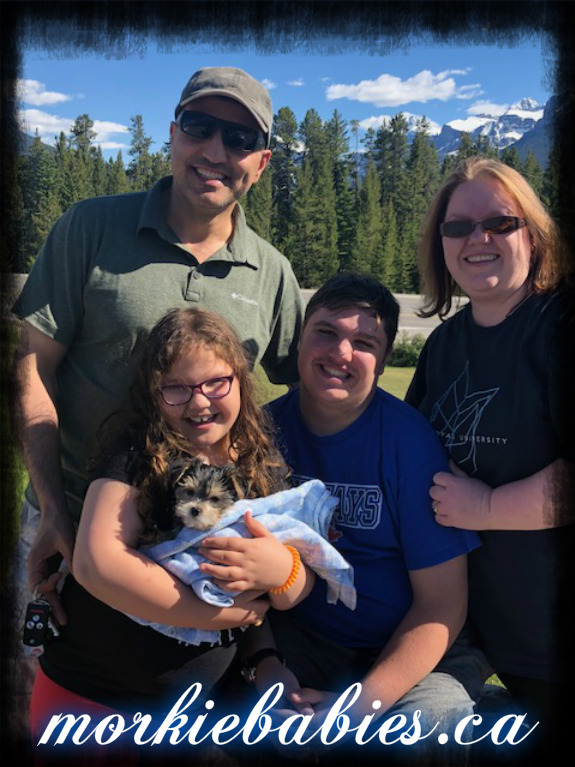 🙂 ~Patrick, Silvia and family from Vancouver, B.C.